Growing up, I rarely missed the Minnesota State Fair. It was an annual rite, the consummation of summer, one last fling of deep-fried joy before school began and common sense and schedules returned to rule. When I was young, I went with my family and stared silently at the inappropriate t-shirts and tattoos. It was all so foreign and loud. Exotic, but not in a good way. As I got older, I went with my friends and gorged on mini-donuts and freedom. I shrieked from the steel confines of rickety rides and linked arms to do The Monkees walk down the middle of a crowded street, tickled at our own hilarity as only 15-year-olds can be. As I got even older, I started shilling at the fair. I drove to the application office with my best friend, singing Paula Abdul and Wilson Phillips at the top of our lungs, and we were assigned positions in a nut roll booth in Heritage Square. We wore bonnets over our pony tails and gingham aprons over our shorts and we smelled like caramel for weeks. Eventually, I networked my way to a waitressing position at Andy's Diner, a '50s inspired, stool-surrounded counter, that served breakfast, lunch and dinner in-between dance routines set to music from "Grease." (If you ever want to see me dance, just queue up "Greased Lightning.") It was a jostling, playful, greasy place, and because we opened a full week before the fair did, we even had regulars. The police officer who came by just before gates opened to take a egg sandwich to go, the 4H kids who came by in late morning for a shake, the carnies (ohmyword the carnies) who left black grease marks on our white counters and asked for ashtrays with Southern drawls and who winked at me with dull eyes set in crinkled skin. "Honey, get me some coffee, and lay on some cream and sugar. I like it blonde and sweet, just like I like my women. Heh. Heh. Heh." 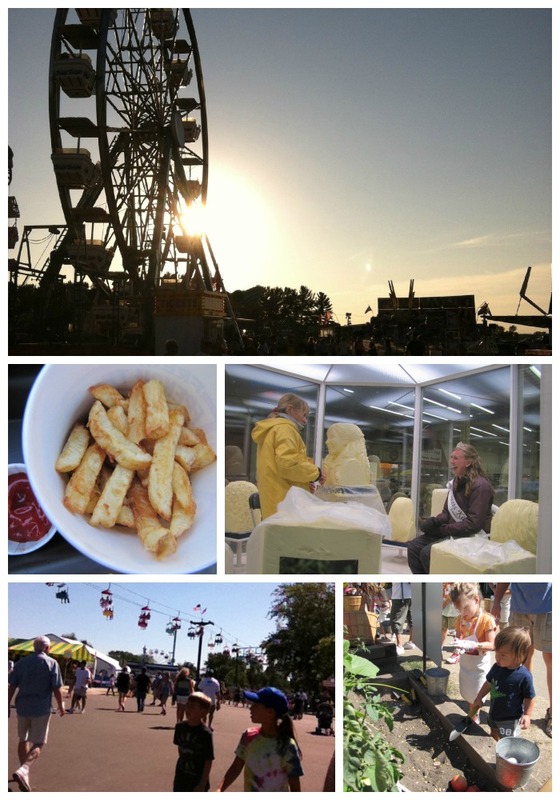 I think for many Minnesotans, the State Fair is a tradition of coming home. Few of us farm anymore, but that doesn't matter. We still take pride in the blue-ribbon vegetables, we marvel at the seed art, we take our children to the dairy barn so they can see where their milk comes from. We smile at the Dairy Princesses - or at least their likeness, carved in giant blocks of butter. We buy the a bucket of warm, gooey cookies from Sweet Martha and eat as many as we can before hitting up the All You Can Drink Milk booth, where we remark with a smile that we remember when a glass only cost 25-cents. We ride the giant slide with our children and remember our own trips down the green and yellow curves. It seemed so much bigger back then. Maybe for all those reasons, it's hard for me to miss a state fair now, even if I've already attended the county fair, even if I know it will be crowded with people who will challenge my concept of personal space and how many tattoos belong on one body. It's the Great Minnesota Get Together, and summer isn't complete without adding another layer of grease, sweat, laughter and ice cream drips. Memories on a stick. That's what the state fair really sells. And I'm buying. I'll also have two more ears of grilled sweet corn, please. Summer isn't over yet. I have never been to the fair. I still can't figure out why! I'm going to find me one now. I've been to many a county fair but I'm trying to remember if I ever went to a state fair. I don't think I have. And now after reading this, I think I must make plans next year to go. If not Illinois or Tennessee, then certainly a trip to see you and experience Minnesota's. LOVE the fair and your story telling!! I have no idea how I found your blog but I'm glad I did. You know, it might have been through Amy Dong. I am a fellow former MOPS attender at Hope. Anyway, I loooove this post! It belongs in a magazine or something published because it's that good!